Out in the woods beside the cabin in the dead of winter, I found various winter insects on a post-Christmas winter walk. 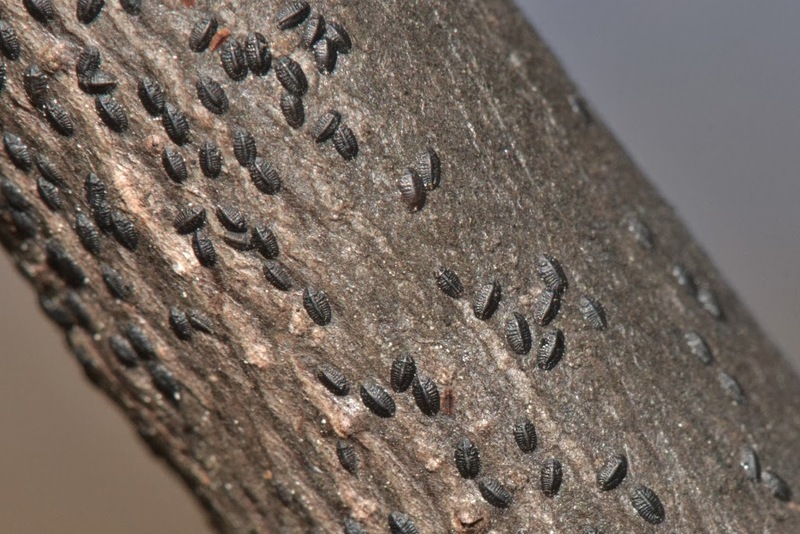 This post is about the many overwintering scale insect crawlers I encountered. These Tuliptree Scale crawlers looked like miniature pill-bugs covering the branches... and, wow, they must be tough to spend the winter exposed to the wind and cold... at times, covered in ice and snow. 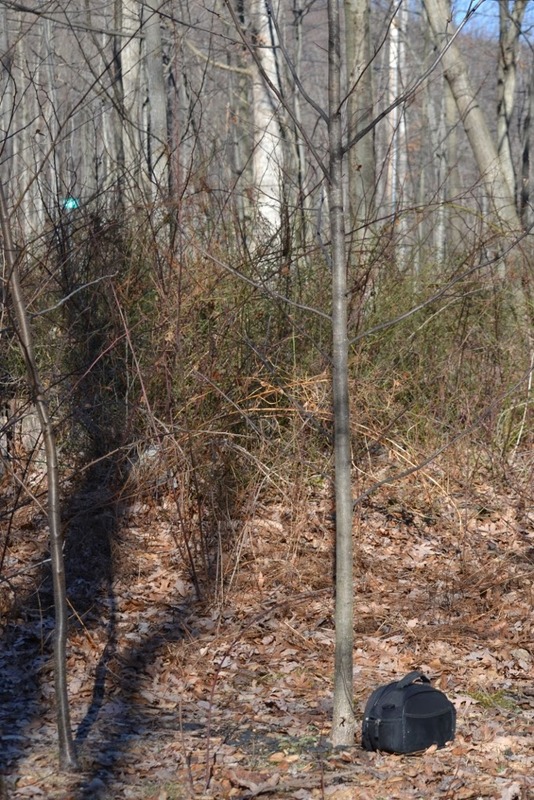 A few adult Tuliptree Scale remained on the twigs. 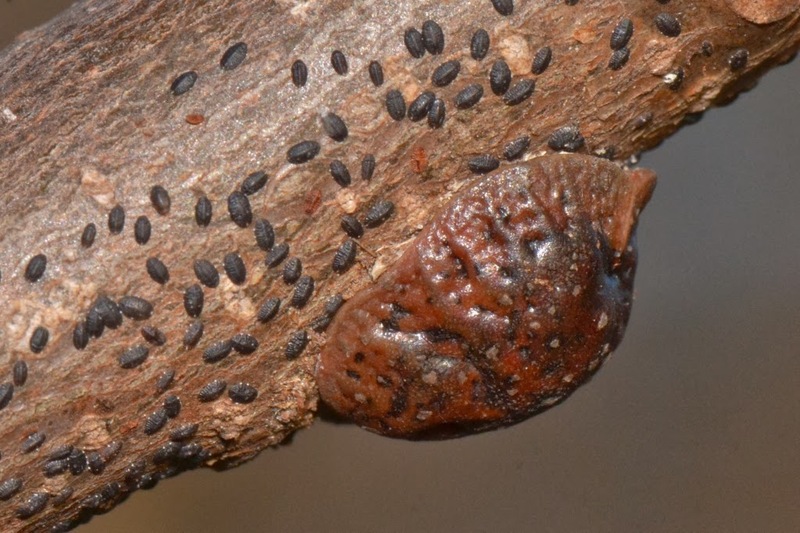 I expect those adult scale insects are dead, having produced thousands of young late last summer. Those pinhead-sized crawlers spent some time feeding on the leaves and growing before settling on the tree branches for the winter. 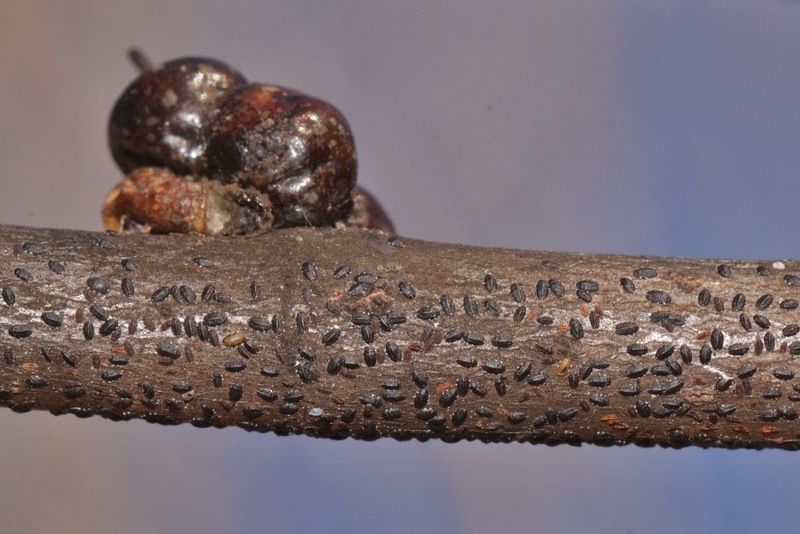 These miniature scale insect larvae were thick on the branches and twigs of a poplar sapling that was growing near the cabin. Thick... prolific... abundant... what's the word to describe the hoards of crawlers covering the branches of this sapling? The wife says, "Hideous!". I pity that poor poplar sapling come spring when all those thousands of scale insects start sucking sap in earnest... sucking the life right out of the tree, perhaps causing severe dieback or even killing the tree. Next time it snows or we get some ice I might try to get some more photos of scale insects as they overwinter on the wind-whipped branches. 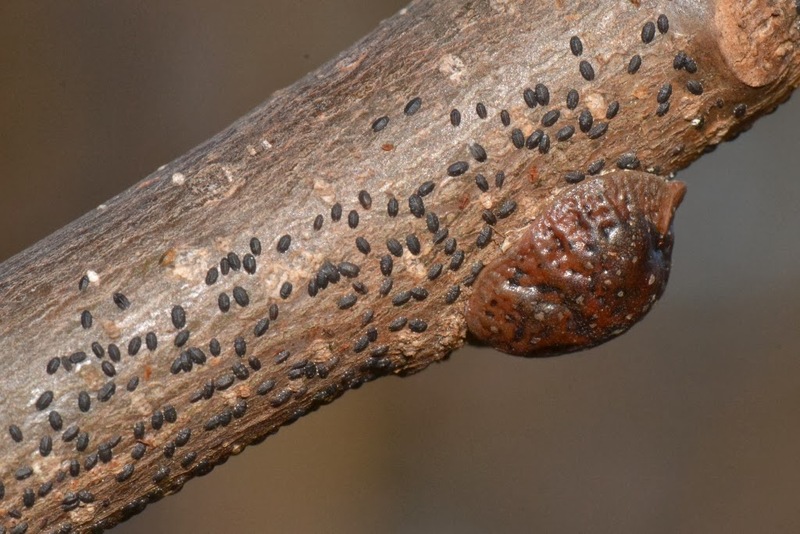 I did a couple of other posts about scale insects: scale insects dripping honeydew and scale insect predators. I have one more winter insect to post about from my winter walk at the cabin a few days after Christmas.... the winter-flying moths that came to the porch light. Part 1... a post about winter crane flies. 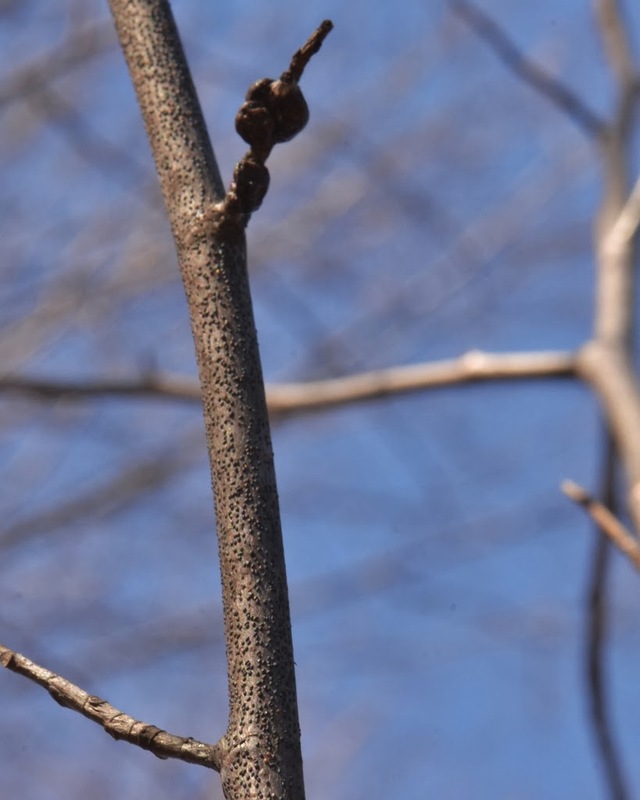 Part 2... a post about over-wintering inchworms. They asked, "What are you looking at?"